Publicity Creating organized a press-conference «Ukrainian air conditioning market, 2012: results, trends, perspectives”. 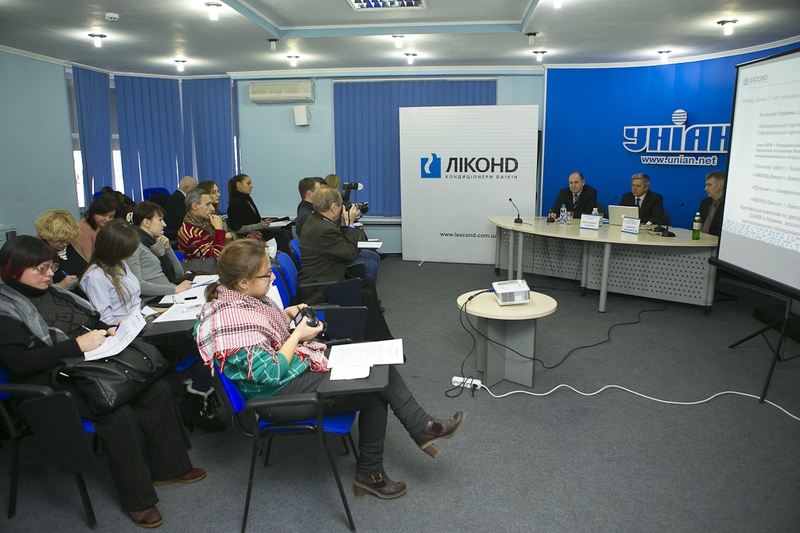 News / video / Publicity Creating organized a press-conference «Ukrainian air conditioning market, 2012: results, trends, perspectives”. On December 13, 2012 a press-conference “Ukrainian air conditioning market, 2012: results, trends, perspectives” organized by LEACOND, the authorized sales partners of Daikin (Japan) and the official partner of HOVAL (Lichtenstein) took place in Kiev in the IA “UNIAN”, Ukraine. During the press-conference the overall results of air conditioning market in Ukraine, the contemporary trends of European market were summarized and the perspectives of air conditioning industry future development were announced. The LEACOND CEO, Vladimir Stepura, presented information about the current conditions of Ukrainian air conditioning market and forecasts as for its development in 2013. According to the announced findings, 2012 appeared to be rather hard for the air conditioning equipment market. According to preliminary assessments the sales volume at the air conditioning market has decreased by more than 20%. • The number of air conditioning brands (Trademarks) – 60. • The leading distribution companies – 10-15. • The number of dealers >1500. • Large share of single split systems (~96%) . • Small share of multi split systems (no more thsn 1%). Among the most popular models in the domestic air-conditioning manufacturing industry in 2012 remained the wall mounted split systems: with the cooling capacity of 7 kW (wall) and 12 kW (channel). As for multi split systems segment, the VRF-systems with the cooling capacity of 28kW were in the greatest demand. The chillers with the lower capacity and air-cooled condenser (cooling capacity ranges from 80 kW to 200 kW) were also very popular. Summarizing, we can ascertain that among the key trends of the next year are the strong demand in highly profitable systems and integrated solutions for large objects, as well as in the energy-efficient and reliable equipment within the construction and private projects. Though, the quantity of real objects doesn’t excite a huge optimism among the market operators for the present time being. Additional impetus to the development of air-conditioning market will get the service area, and the key marketing tools will be different loyalty programs for customers and partners. The agency’s work consisted of the following: preparations for the event, the choice of the hall, the accreditation of journalists (more than 20 publications, specialized-, business- and news agencies), video and photo reporting, conducting the reportage from the event in social networks, text materials and report preparation. Publicity Creating has been organizing press events for LEACOND Сompany for 8 years (8 press lunches, 14 press conferences and round tables in the leading news agencies and restaurants).